On Friday, I decided to buy Hong Kong securities for the first time. Most of you know that I'm an ardent opponent of stock picking, so to put my money where my mouth is, I decided to go by the way of diversified investment funds. Like all other commercial banks in Hong Kong, Hang Seng Bank, where I decided to open and maintain an account, offers a more exhaustive and thorough list of securities and investment services than the banks in the Philippines. For my particular investment preference, aside from open-ended investment funds (which are basically the same as the mutual funds and UITFs we have back home), Hong Kong banks and other financial institutions also offer exchange traded funds or ETFs, which is something we don't have in the Philippines. 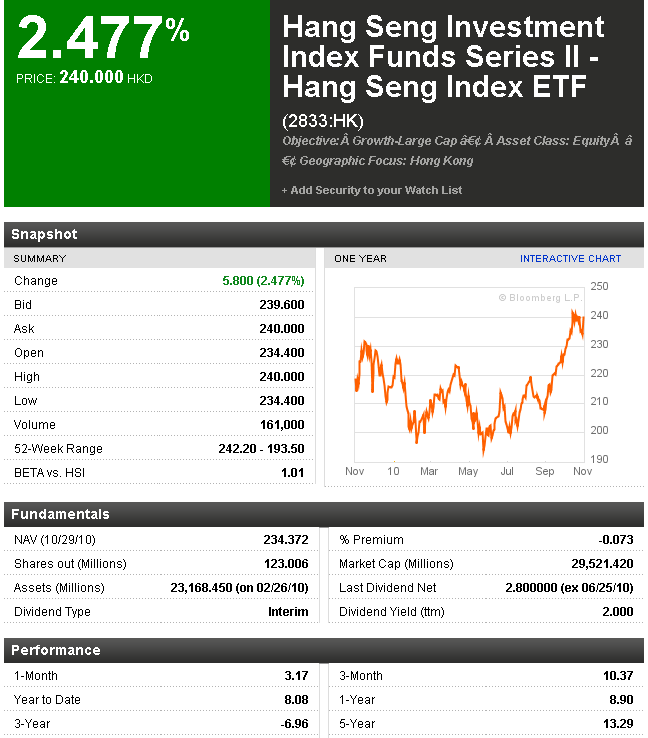 On Friday, I bought 100 shares of Hang Seng Bank's Hang Seng Index ETF (stock code 2833) at the prevailing market price of 233.20 HKD per share. At the end of today's trading, the stock closed at 240.00 HKD per share, netting me gross paper gains of 680 HKD over the weekend, or 3,772.67 pesos. Not bad at all, but of course that's mostly due to luck than anything else. So what are these ETFs, and why are they so popular in a lot of markets around the world? And how are they different from the more familiar mutual funds and UITFs that we have in the Philippines? 1. ETFs are investment funds that can be traded in stock exchanges, unlike mutual funds and UITFs that may only be sold by and redeemed through financial institutions like banks. Also, ETFs are closed-ended, with a fixed number of outstanding shares available, unlike open-ended mutual funds and UITFs; this is what makes trading ETFs in stock markets possible. 2. ETFs are also invested in underlying securities like stocks, bonds, and other instruments, like other investment funds. 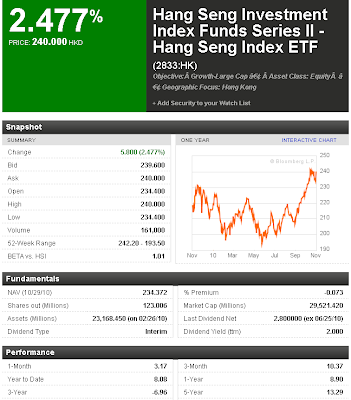 The ETF I purchased tracks the Hang Seng Index of the Hong Kong stock exchange, and is thus invested in the component stocks of that index. 3. ETF share prices are determined by the market. The share price of ETFs are driven by supply and demand forces, unlike open-ended funds whose net asset values (NAV) are computed at the end of each trading day. Therefore, while a lot of ETFs are designed to closely follow the movement of certain indexes, ETF returns can still deviate significantly from the performance of the underlying assets or index. 4. ETFs are much cheaper than other investment funds. While a lot of open-ended investment funds in Hong Kong charge around 3% per year in fees, ETFs are just covered by the usual trading charges, which amount to just around 0.6% per transaction. Therefore, if you are a firm believer of passive over active investment, then ETFs are the way to go since you won't have to pay for high management fees. 5. ETFs pay dividends to shareholders, unlike mutual funds and UITFs that reinvest all gains back into the fund. 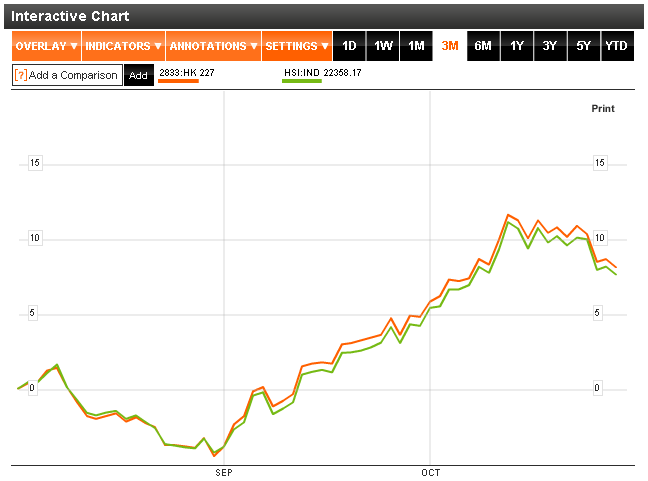 For example, the HSI ETF I bought has a historical dividend yield (dividends divided by the share price) of 2% per year. This yield makes up a portion of the total returns earned by investors, on top of capital gains when the share price appreciates. It's unfortunate that ETFs are not available to investors in the Philippines; the funny/frustrating thing is that an ETF based on Philippine stocks has already been made available in international exchanges for international investors, but it's not available to us poor Investor Juans. 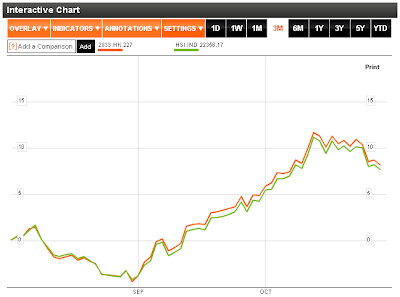 Still, there are rumors that ETFs will soon be introduced in the Philippines. Would you be interested in buying some when they do become available?